We view being a Wesleyan student as a single ability (when it is in fact comprised of many), and when you start failing at one, your whole ability and identity as a student in called into question. …then come join the conversation. On Monday, October 14th from 7 – 9 PM Olivia Chavez and Aletta Brady will facilitate the second of the Privilege and Policy at Wesleyan series. The discussion will cover how differences in ability – neurological, psychological, and physical, on the spectrum from transient challenges to long-term differences – intersect with privilege and policy at Wesleyan. We will address topics like sports injuries, medical leave policy, accommodations, building accessibility, Davison and CAPS, and anything else you care to bring up. We invite all students to come speak, brainstorm, and meet others in the community who are interested in changing the environment at Wesleyan. 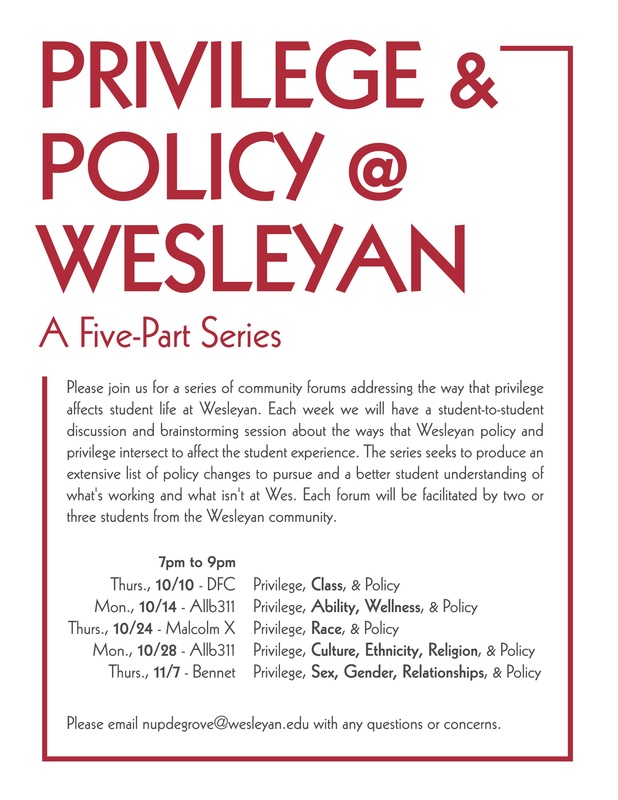 Posted by Wesleying in Events and tagged Ability and Wellness, Privilege and Policies Series on October 13, 2013 at 6:15 PM.